Welcome to the online home of the Treasury Historical Association (THA). We celebrate and share the over 225 years of US Treasury history and work toward the restoration of the Treasury Building in downtown Washington, DC to its historic beauty. Please browse through this website to learn more about the history of the Treasury and the THA. Thank you for visiting. THA’s current education initiatives include preliminary work on a documentary film on the history of the National Historic Landmark Treasury Building, next-door to the White House, and on many nationally-significant events that occurred within it over the past 175 years - events that affect and serve the Nation and its citizens. A seven-minute "trailer" or preview of the film will soon be available. THA is currently seeking sponsors to assist in funding the production of the film, which THA plans to have aired on a nationwide television network, with residual sales in the form of DVDs and streaming videos. For information on underwriting and sponsoring opportunities, please contact THA by email. Please see further details on THA’s “Programs” webpage. 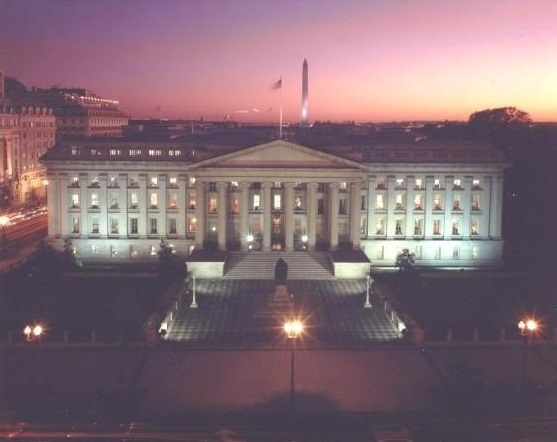 Fortress of Finance: The United States Treasury Building, the Treasury Historical Association’s book on the history of the Treasury Building and the predecessor Treasury Office is the result of over eight years of research. It presents a captivating account of the construction of our National Historic Landmark and its unique architectural features that have made it one of Washington, DC’s most magnificent structures. The book includes an appendix with a summary of histories of the Treasury’s current bureaus and those now in other departments and agencies.